Stepping into the batter’s box and facing live pitching takes confidence. The transition from machine pitch to live pitching can be stressful for young players. No one at any level likes being hit by a pitch, but it happens . Overcoming the fear is key for young hitters. From the time I started throwing wiffle balls to Lefty for batting practice, I would intentionally let one get away and hit him with the wiffle ball. Hoping it would prepare him for what WILL happen at some point. Now thinking about it, he has been plucked once so far in a game…so far. He does not mention any concern over being hit and I don’t think it crosses his mind as far as I know. Maybe because he pitches, he knows the ball will get away from you at times. Now really thinking about it, he has plucked one batter…coincidence..hmm. Nah, no retaliation, it was different teams and games. 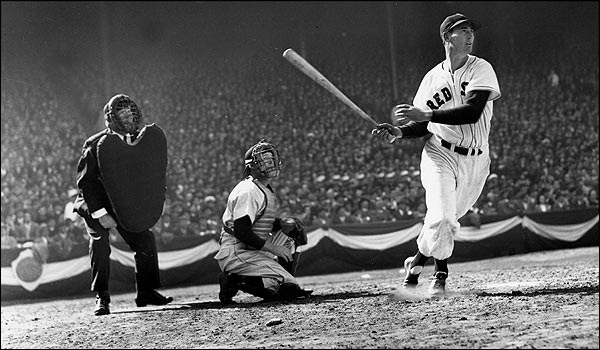 I believe as Ted Williams did that “hitting is 50 percent above the shoulders”. Besides working on the physical part of hitting, I like to talk with Lefty about his mental approach at the plate. Step into the box with a plan. What is your role? If you are batting #1 in the lineup, then maybe you see a couple of pitches. Your job is to get on base. Are you batting in the middle of the order? Then you look for a fastball and be ready to hit that pitch. Your job is to drive in runs. A good friend and coach I know said his approach at the plate was “yes, yes, yes…” which means he was ready to hit every pitch until that pitch told him no, do not swing. I like that aggressive approach. Ted Williams had an extremely aggressive approach at the plate. “There’s only one way to become a hitter. Go up to the plate and get mad. Get mad at yourself and mad at the pitcher.” Worked for him. I recently told Lefty to swing as hard as he can, without losing control. I noticed he was concerned with making contact and would not allow himself to let the bat fly. Duke Snider said, “swing hard, in case they throw the ball where you are swinging.” Lefty does swing hard now and rarely gets cheated. He may miss, but not cheated. Swing hard, swing often, Lefty. Good things will happen. And just like Ted Williams said, “I’ve found that you don’t need to wear a necktie if you can hit”. Love that quote! Hate that I have to wear a necktie.